Iconic American soda company PepsiCo – originally known as “Brad’s Drink”, believe it or not – announced on Monday that its long-serving, high-profile female CEO Indra Nooyi would be stepping down. Gulp. 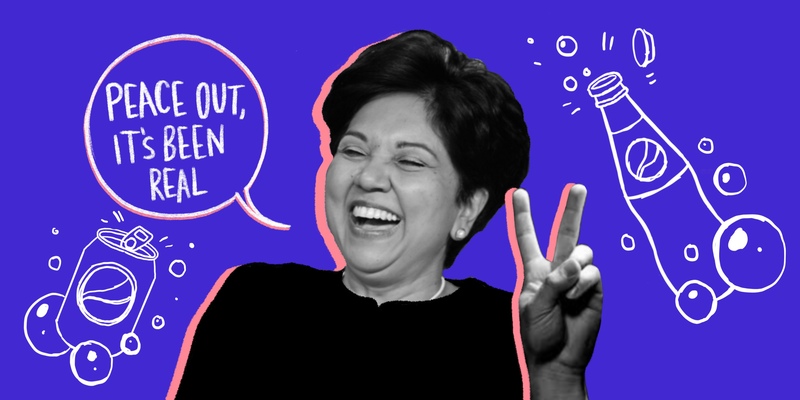 Nooyi’s spent 22 years with PepsiCo, steering the ship for 12 of them (more than twice the median tenure for such a role). As the food and beverage landscape has changed over the years and companies increasingly contend with rapidly-shifting trends (like vegan and organic), Nooyi led PepsiCo into new “better for you” products. Traditionally associated with sugary sodas and salty snacks, PepsiCo got itself a stake in hummus maker Sabra back in 2007. More recently, it bought KeVita – a producer of kombucha (that’s a type of trendy fermented iced tea, for those of you who don’t live in Brooklyn) – as consumers shunned unhealthy beverages. PepsiCo’s sales grew 80% during Nooyi’s time at the helm and its shares climbed 79% (though Pepsi’s performance still trailed arch-nemesis Coca-Cola’s and the general market). The bigger picture: Food and beverage CEOs are jumping ship left and right. For you, personally: Girls, we (don’t) run this mother. Nooyi’s departure (and male replacement) will leave just 23 female CEOs running S&P 500 companies [tweet this] (a group of large companies trading on American stock exchanges that covers about 80% of the market). That’s less than 5% – a level that hasn’t changed much in the last decade, despite women now making up almost half of the US workforce. And, according to a study published in April, white men react negatively to the appointment of female or racial minority leaders – offering less help to their co-workers as a result. Thanks, guys!